On Friday I woke up very early to be Furor's guest model- their regular model had to cancel this week so my friend Tatiana wrote me.... and you know, I tried with my shortness and everything. We had so much fun, and can't wait to see and share the final pictures on the site (ps. the new collection includes so many cute pieces!). After playing "model", I changed to this and we headed to Ceviche105- our new favorite place (and now I live like 2 blocks aways so you can imagine...we are going to be there all the time). The look is very monochromatic but it also includes a fun houndstooth print on the pants- I paired the pants with a white peplum top with gold studs on the neckline. Hope you liked it and once again...thank you so much for stopping by, it means so much to me! Great outfit! I love those printed pants! 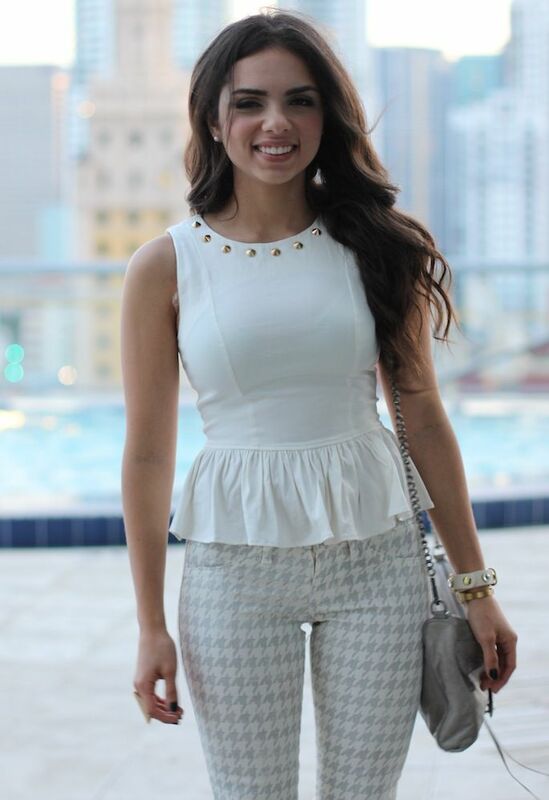 OK - so I TOTALLY love this ENTIRE look - the peplum is ADORBS, and the houndstooth - too cool for school! I absolutely love 2020 Ave so glas I learned about it from your blog =] .. *Ps you look great. Can't wait to see your model photos. Such awesome look, like always! estás guapisima!!! los pantalones son una maravilla!!! Ur so pretty love Ur outfit!!! Xoxoxo Danny!! Gorgeous! I'm loving this neutral look and how it still stands out! cute outfit, love the pants. Qué outfit tan bonito. Me encantan las sandalias. No soy muy de colores claros pero a ti todo te queda perfecto!! Your pants are really nice, I like neutral colours, Brilliant outfit. Houndstooth is my all-timed favourite!!! I think it's soooo classy!!!! I like my skirt Marks&Spencer with this print!